The beautiful giant candles make a show. 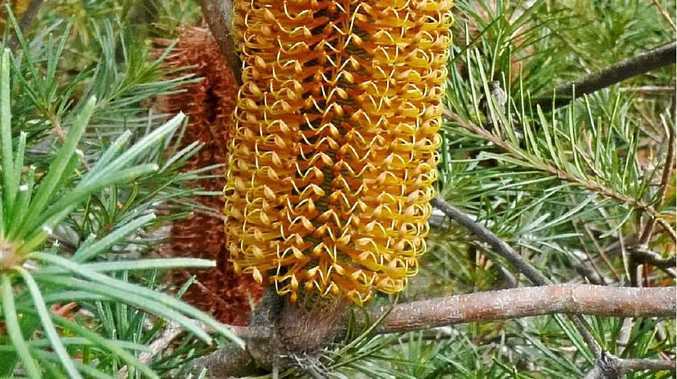 ONE of the most popular of Australian native plants is the Banksia family, that contains a very broad range of plants from ground covers to low and tall shrubs as well as trees. The brightly coloured flowers make an extraordinary display, and even when those flowers fade, they are still eye-catchers. Their growing requirements are easy to provide: they need well-drained soil, and thrive in full sun to dappled shade. phosphorous, and you'll find there are some good ones available stating they are ideal for natives. If you notice at any time the leaves are yellowing, it is safer and quicker to provide iron chelates following a good thorough watering. There are some outstanding Banksias flowering at present. We enjoyed seeing some of the lovely tall shrub form B. oblongifolia displaying their soft honey coloured flowers in the Wappa Dam park this week, while the magnificent B. giant candles is making a real spectacle of itself at Fairhill Nursery, on Fairhill Road, Yandina. Giant candles, which are a cross between B. ericifolia and spinulosa, grows about 5-6m tall, and 1.5m wide, and produces absolute masses of the largest flowers you can imagine - 40-50cm long from now through winter into spring. Into the bargain, these beauties are also most attractive to honey-eating birds, and the rainbow lorikeets that were happily feeding in the tall shrub we were admiring, absolutely ignored us being right near them. So, if you're looking to attract birds to your garden, and seeking something colourful in the garden for the winter, don't look past this one. And, while you're about it, consider some of the many groundcover and lower shrub forms available. We also learned while we were at Fairhill that the next Breakfast with the Birds is coming soon. Go along and be guided through the garden by one of the members of the Wednesday Club - birdlovers who know the gardens well - and you could see 60-plus species of birds throughout the area. Elements Restaurant in the nursery, then Nick will provide a brief talk on the right plants to attract birds to your garden. If you are interested in this event, give them a call on 5446 7088 or email them on retail@fairhill.com.au. As readers know, we often write and advise you to eliminate those weeds that are the most opportunistic plants in the garden. Gardeners will have noticed that following rain, the plants that take off faster than anything else are weeds. So, if you want to save some water and nutrients for the plants you really want, get rid of the weeds. Apply the hoe to them as they appear, remove the larger ones roots and all, and if necessary, apply weed poison, always being careful to avoid getting it on your precious plants. Among the many ways to make it easier for yourself is to only spray weedkiller on a wind-free day, and if you're still not confident, paint it on to the leaves of the weeds. An excellent tip our family used quite often in our nursery was the following from Phil Dudman's The Garden Guru. Boil a kettle of water and carry carefully into the garden. As you wander around, pour the hot water into the centre of the weeds. You can, of course, refill and boil the kettle as often as you need it, and finally, make a cup of tea, and wander around sipping and feeling good at the results you get very quickly.